L-com Global Connectivity, a preferred manufacturer of wired and wireless connectivity products, announced today that it has launched a new series of USB 2.0 ECF-style, panel mount, adapter cables for use with data acquisition, test and measurement, entertainment and PC peripheral interconnect applications. These new adapter cables allow USB 2.0 connections to be passed through panels or enclosures by utilizing L-com’s unique ECF flange design. The cables are fully shielded and feature USB 2.0 compliant cable. They feature a bulkhead, Type-A jack to a molded, Type-A, 90-degree plug and can be used with almost any panel thickness. These USB 2.0 panel mount adapter cables are available in two connector options: the U2A00007-series features down-angle USB Type-A male connectors and the U2A00008-series features up-angle USB Type-A male connectors. These cables also feature 30 micro-inch gold-plated contacts for reliable connections even with repeated mating cycles. Screw mount hardware can be purchased separately. The cables are available in off-the-shelf lengths of 12, 24, 36, 72 and 120 inches. “Our new USB 2.0 ECF-style, panel mount USB adapter cables provide installation flexibility by featuring a right-angle connector and allowing the cable to be passed through panels or enclosures. Many of our OEM customers will find these new cables very useful in their enclosure designs,” said Brian Gates, Product Manager. 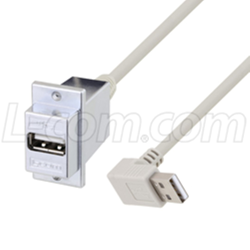 L-com’s new USB 2.0, ECF-style, panel mount, USB adapter cables are in stock and available for immediate shipment.